First things first, vision is exhausting when you’re not used to using it. 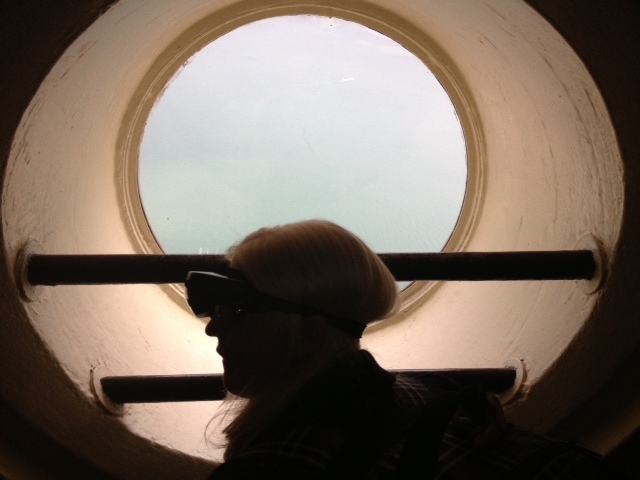 I have partial vision, but for many tasks I am much more efficient, and safer, if I rely on my other senses. Therefore, my visual system is not used to working this hard, I guess I have let it be a bit lazy. Physically my eyes were tired of constantly trying to focus on the screen in front of my eyes, I was constantly zooming the unit in and out, looking at this and that, watching the world around me, making the most of the experience. The muscles of my eyes were not used to this. The unit itself was a bit heavy, so my nose and neck also became fatigued. This did not shock me, my eyes fatigue on a normal day, even when they are not being taxed. What did surprise me was the mental fatigue. As I needed to zoom in, like the zoom feature on your video recorder, to make things large enough for me to see, I was only seeing part of an object at a time. With only a tiny piece of the visual picture, I was constantly asking the person I was with what I was looking at. When commenting on an interesting piece of art, after a moment of pause, a friend told me I was looking at a window. My brain was on overload, and although I could see things, I often needed assistance to figure out what I was looking at. Second observation about vision: it is distracting. I really don’t know how people can get through their day when they have 20/20 vision. There is something to look at, movement or colour that catches your eye or an interesting shape that grabs your attention, all the time. I could barely make it through a conversation without getting distracted by something that just had to be looked at. Of course half the time I didn’t know what I was looking at, and ended up interrupting the person I was with to ask them about it. Every time I saw something new I had to ask whoever I was with if it was normal to see that. I can’t believe how much a fully sighted person really does see. It’s miraculous that you sighted folk ever get anything done, there is just so much to see, all the time! Not only is vision distracting, but it is also a very dominant sense. It just steps up and takes over for all your other senses and is very reluctant to share your brain with anything else. When I was walking with my guide dog, I would be looking in the distance, walking along in a familiar area, and I was stepping all over the poor pups feet because I wasn’t paying attention to the gentle cues he gave me through his harness handle. Once, when I was sitting on a public bench, I became so absorbed in people watching, that I didn’t realize that the soft voiced elderly woman who smelled of lilacs was no longer sitting beside me. She had been replaced with a fowl smelling loud voiced younger man. This realization that I was no longer fully connected with my surroundings, made me feel very insecure and my anxiety rose. 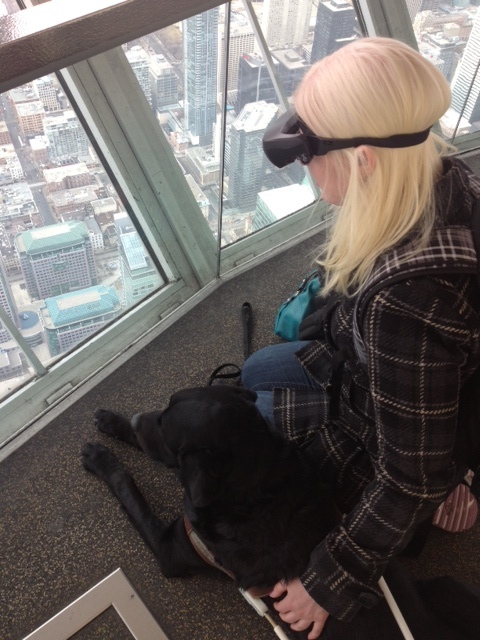 I quickly put the glasses away in my bag, and the sounds of the world came back to me along with the gentle calming press of my guide dog leaning against my leg. I always thought that if you could see what was happening around you, you were safer, but not when this sense takes over all others and creates tunnel vision on only one part of your environment. In the right situations, vision can be a pretty nifty thing. I can now say that I have observed the graceful motion of a swan bending it’s neck to take a drink of water. I have watched a plane take off, a boat speed away, and cars manoeuvring through busy city streets all from atop the tallest building in Canada. I watched my guide dog romp around the park, and saw the smiling faces of friends and family. These are moments I will always remember. Vision lets you interact with those around you using the environment. You can read signs, newspaper headlines, or discuss pictures on the wall. Small talk is so much easier when you have those sort of environmental cues to guide you. When you know how to use it, vision does have it benefits. I still can’t believe all that can be seen from so high up. It really is amazing how much people can see, and in such detail. I saw a flag from all the way up here, and can tell you it was a Canadian flag! There were also a few moments of great disappointment. It is hard to admit, but even with super-enhanced electronic vision, I am still not good at video games. I tried with just sound, and lost. I tried with sight and sound, and lost, but not quite as badly. I tried with just sight and no sound, and I lost terribly. My new hobby as a gamer was very short lived. The video game experiment may have been just for fun, but I also experimented with reading. I love reading, and although audio books are great, they just don’t engage my mind in the same way. So my aunt and I went to a book store and experimented with trying to read children’s books, puzzle books, photography books, and novels. The words jumped around the pages and I lost my line. I missed entire sections of the book, and soon my eyes started to tire, and my head started to shake back and forth. It was clear that reading a print book was not going to work for me. This was the most difficult moment in my 2 weeks, as my answer to the question “what would you do if you had full vision for a day” was “I would go to a library and read any book I wanted”. That night, I read myself to sleep with my ears, just as I had before, and just as I always will. The glasses have now left, and I no longer have to worry about forgetting them on the bus, or having the battery die just when something amazingly exciting is about to happen, and I am relieved. It took a lot of physical energy to see. It took a lot of mental resources to interpret what I saw. It took a lot of emotional strength to feel secure as a blind person trying to manoeuvre as a sighted person. My final conclusion is that vision has its moments of intrigue and awe, but as most of my “vision bucket list” now has check marks beside it, I am perfectly content going back to being me. I know how to be a vision impaired person, I know all the tricks and tips, the ins and outs, the dos and don’ts, and how to make my world work for me. Seeing the world through electronic eyes has reaffirmed my believe that I am just fine the way I am. This entry was posted in Accessibility, Life & Balance and tagged accessibility, accommodation, clarity, electronic glasses, vision, visually impaired. Bookmark the permalink. This is a fascinating read. I do think that sighted people filter what they see completely differently. The brain of a sighted person “tunes out” a great deal of visual stimulation. I consider myself a highly visual person (I’m an artist) and even though I see small details other people likely don’t even notice, (like for example, my perception of colour is such that I “see” the undertones of the colours all the time) there is still a level of filtering out that happens. There was a movie about a guy who had his sight restored and how utterly overwhelming and at times dangerous that was for him. I could see how it can quickly cause your brain to feel overloaded. I have some hearing loss and I find any time I’m in a big crowd and having to listen to conversation, I come home mentally exhausted. The level of concentration I need to have to hear properly can become painful at times. It sounds like this is the same for raising your visual ability. I love that you have a black Lab. I am also a black Lab owner. They are such sensitive and loving spirits and I agree, very comforting to have by your side. Thanks for sharing this. My best friend who has low vision has been reading your posts on this as well. I, too, found this fascinating and very informative to read. For those of us with so called ‘normal’ sight, we have never known anything different. Just as you have never known anything different. I agree that we automatically filter all those things that we see on a regular basis and which we ‘know’ what they look like. Probably to the extent that we longer look up into the sky on a daily basis or really take the time to look/investigate/see things. It’s a shame really. One time when my visually impaired son was about four years old, my optometrist tried to correct my eyes up only to the level that my son saw on a daily basis. When I walked outside with those glasses on, I was quite stunned to realize just how much detail was missing. Detail that I took for granted prior to that experience. Your blogs are certainly well written and educational. And while I love reading them, the thing I loved most, was reading about any young woman who knows and embraces the fact that she is “just fine the way she is”. Keep up the good work. Leona, thanks so much for your heartfelt and candid thoughts about using our device. We learn a great deal by understanding peoples’ experiences like yours. We’ve seen that people who are “recently partially sighted” versus those that have been legally blind since birth, can have very different responses to the technology, just as you’ve so articulately written. The problem solving engineer in me is disappointed because I want us to solve your “problem”. Of course, that’s rather presumptuous and arrogant! You, and many others, are teaching us that it’s acceptable and wonderful to feel great about yourself just the way you are, and to embrace new technology to the extent that it’s useful and comfortable, but not let it force you to a place that doesn’t feel right. That’s a different threshold for every individual and in the end, it’s such a personal decision. I respect you for sharing your journey so honestly and publicly.